The 10th edition of Fab Academy, the world’s first distributed class on digital fabrication, has been announced and admissions are now open! 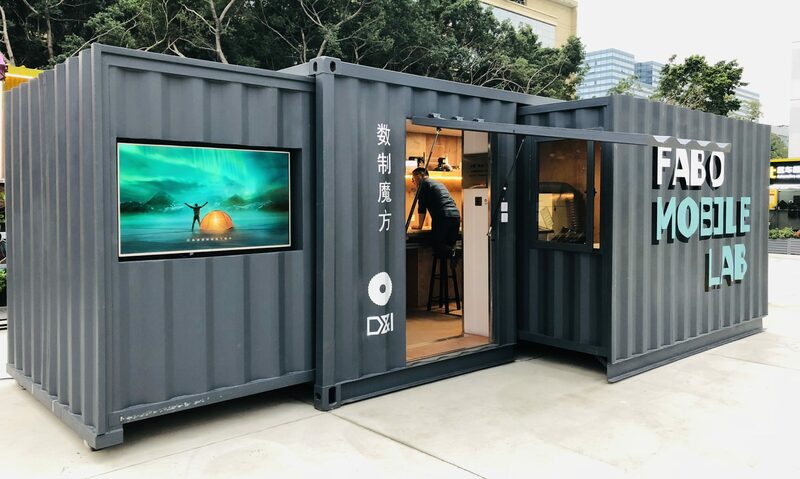 Fablab O Shanghai in the College of Design & Innovation of Tongji University is one of the nodes that offer the program worldwide: enroll and experience life at China’s number one Design College’s Fablab! The Fab Academy Diploma is a 5-month part-time learning experience where students plan and execute a new project each week. At Fab Academy you will learn how to envision, prototype and document your ideas through many hours of hands-on experience with digital fabrication tools. The Fab Diploma is the result of the sum of Fab Academy Certificates. Progress towards the diploma is evaluated by a student’s acquired skills rather than time or credits. The Fab Academy is a fast paced, hands-on learning experience where students plan and execute a new project each week. Each individual documents their progress for each project, resulting in a personal portfolio of technical accomplishments. Fab Academy is a distributed educational model providing a unique educational experience. Each Fab Lab that participates in the Fab Academy program is part of a global Fab Lab / Fab Academy network. These Fab Labs are Nodes that offer the Fab Academy program. Students view and participate in global lectures broadcasted every Wednesdays at 9:00 am – 12:00 pm EST. The lectures are recorded and available to students throughout the semester. In addition to the lectures, there are 2/3 lab days each week where students have access the digital fabrication equipment and personal help with projects. Fab Academy faculty, who are leaders in their respective fields, provide global video lectures, supervise academic content, and guide research. Hands-on instruction in the labs is provided by instructors who supervise and evaluate Certificates, develop and disseminate instructional material, and assist with projects. The Fab Academy Program is directed by Neil Gershenfeld, director of the Center for Bits and Atoms at the Massachusetts Institute of Technology, and globally coordinated by Fab Lab Barcelona team. Students of Fab Academy comes from various backgrounds: engineering, design or architecture, as well as biology, art, music, economics, management. No previous knowledge is required and every week a new subject will be introduced with a bottom-up approach. The program will run for 19 weeks with a new subject introduced every wednesday: how to design for and use all the tools in the Fablab such as the laser cutter, the 3D printer and CNC machine; design, fabricate and program electronic devices, sensors, internet of the things (IoT) devices; make wearable objects, master techniques such as molding and casting and composites, create wooden furnitures and be able to document your work with an online portfolio learning how to code your own website with HTML and CSS. WHY SHOULD I ENROLL?Fab Academy is internationally reknown to be the most complete course on digital fabrication, based on the popular “How to make almost anything” class from the MIT. You will experience how to work and think the Fablab way going from “I don’t know how to do it, so I will not do it” to “I don’t know how to do it, but I will find a way”. 它是怎样开始的呢？ How did it start? Fab Academy was developed to teach hands-on skills in fab labs, which began as an outreach project from MIT’s Center for Bits and Atoms, and has grown into a global network of more than 500 labs. Fab Academy instruction is based on MIT’s popular rapid-prototyping course How To Make (almost) Anything, both taught by Prof. Neil Gershenfeld. 它是如何工作的呢？ How does it work? The program takes place from mid January to late June. 每周，教授尼尔·格申菲尔德（Neil Gershenfeld）都会就话题进行全球性的演讲Every week, prof. Neil Gershenfeld holds a global lecture on a different topic. Instructors in local labs provide hands-on activities on the topic, and offer their practical knowledge to help students develop the week’s assignment. Students work on the assignment using lab materials, equipment and machines, immediately applying all the concepts covered in the global and local classes. All the materials are included in the tuition fees. Students document their progress in a personal blog hosted in theFab Academy Archive. In parallel to the weekly assignments, students work on a personal final project which will integrate mastery of all the skills learned during the course. Students who complete all modules and final project go through a global evaluation process that leads to the Fab Academy Diploma. 我会学习使用什么机器？What machines will I learn to use? A computer-controlled laser cutter, for press-fit assembly of 3D structures from 2D parts. A large (4’x8′) numerically-controlled milling machine, for making furniture (and larger) sized parts. A vinyl cutter, to produce printing masks, flexible circuits, and antennas. A desktop sized precision (micron resolution) milling machine to make three-dimensional molds and surface-mount circuit boards. 需要多少时间？How much time does it take? The time commitment is about 16+ hours a week at minimum, but could be far greater if the student is highly motivated, does not possess the background for a particular unit (or units) or just wants to really throw themselves into the program. 是否有认证？ Is there any accreditation? The Fab Academy Diploma will be issued by a distributed Global Evaluation Committee after satisfactorily completing the course of study in the Principles and Applications of Digital Fabrication. Individual certificates will also be issued for students successfully completing individual topics. Fab lab会帮我找到一份工作吗？Will Fab Academy help me find a job? Many Fab Academy graduates improved their career opportunities after taking the program. There’s high demand in the job market for talented digital fabrication experts and fab lab managers, but the knowledge offered by the course can be applied to any profession requiring rapid prototyping. Many graduates also started their own businesses offering locally produced design objects, toys, training services and consulting. Take a look at the opportunities available at http://jobs.fabeconomy.com as a reference for jobs coming from the Fab Lab Network. FABO will provide scholarship after students graduated from global classes with job offers in various locations of FABO schools and institutes. Fab Academy Diploma costs 5000 (USD/EUR). Please note that the program will run only if the minimum number of students is reached. Applying students will be informed in advance if the number is not reached.